After writing about connecting with people on campsites, yesterday F and I met up with friends we'd made on a campsite two and a half years ago. It had been too long, and was too short a visit but wonderful to see them again. 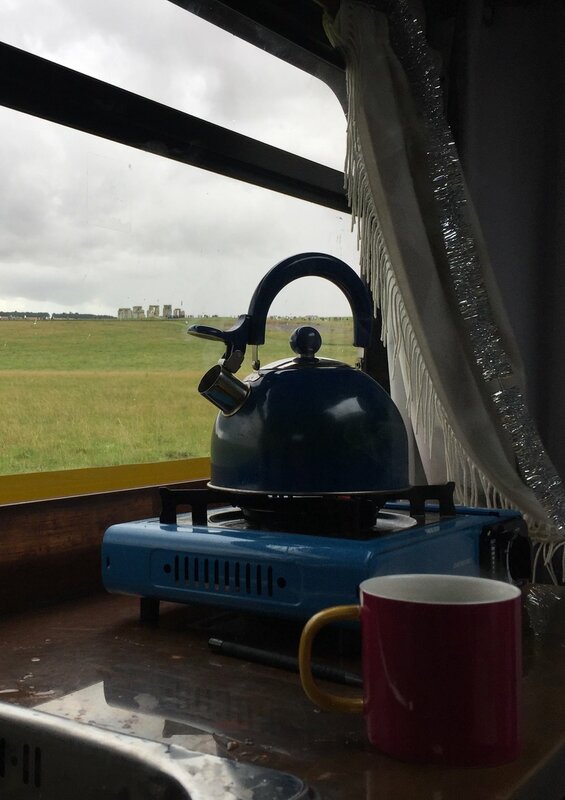 We met at Stonehenge on one of those unfortunate British summer days; 17 degrees, on/off downpours and blowing like crazy over the exposed Sunbury plain. Of course at our allotted visiting time the wind and rain were stuck on the on switch. Even in driving rain, the site is fantastic. The stones are just massive, even at a distance (you can now only walk between the stones on the solstices) it's clear what an epic effort it must have taken to move them. In fact it would still be an impressive feat of engineering today let alone doing it when they just had stone tools. My realisation this visit is that there must have been a lot of surplus. Surplus food, surplus time. Each stone must have taken weeks, months, even years to move from Wales, all the while having to produce and gather enough food to live and thrive as a society. It's possible there was a pharaoh type figure ordering things. Perhaps it's easier for my understanding if there was, rather than a bunch of hunter gatherers/early farmers having so much time on their hands that while sitting in their primitive huts around the fire they decide to dream big: "I know what we'll do I've got a really good idea; we'll go to wales, carve out a rock twice the size of my hut here, then we'll bring it all the way back and plant it in the middle of our perfectly serviceable wooden henge. Who's with me?" After saying our adieus to our friends, we squelched up into the van, dried off and set off to our free camping site. I'd heard that there was a path in view of the stones that was widely used to free camp. It's not the smoothest path, but sure enough we parked with around 15 other vehicles within site of the stones. I have genuinely no idea how or why this has been allowed to happen but it's truly fantastic. Here we are at a Unesco World Heritage Site where no one is allowed to build a thing, even the visitor centre is a mile from the stones but F and I, in our bus are allowed to spend a or many nights with this view for free. Nice one English Heritage! Or perhaps well done to the druids and hippies and others who must have worked hard at reclaiming the stones for ongoing use and negotiated access. We will definitely be back.